Spin This: "Oh Girl, You're the Devil," "Talk About You," "Staring in the Sun," "Good Guys"
Pleasant collection of moving simpler pop and a few thumbs-up curve balls; storytelling and smart lyricism intensifies on "Good Guys" and "No Place Like Heaven". Brit singer Michael Penniman Jr., stage name styled as MIKA, hasn’t made a big break in the U.S. of A. The closest he’s ever achieved was “Grace Kelly,” a nine-year old gem pickled with a bubbly Beatles-meets-Queen pop. Although it stalled at number 54 pop, it went to number one in his native land. Since then, MIKA has released a handful of albums that have added extra gems in his crown as a UK pop star. They have been decent exercises but pointed out how often American ears aren’t exactly hip to European musical trends. Had the groovy R&B-meets-bubbly ’80 pop workout of “Lola” been released as a single off of 2012’s The Origin of Love, MIKA may have had been blessed with half the success of new soul crooner and fellow Brit singer-songwriter Sam Smith. No, he’s not an emboldened blue-eyed soul crooner in any sense of the word — his vocal style is more like a unique mesh of Rufus Wainwright and Tyler Glenn. But his track record of unveiling an attraction to warm melodies, classic pop sensibility and colorful harmonies makes up for any shortcomings. 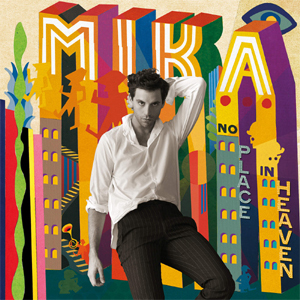 Although MIKA places more of a spotlight on uptempo tracks on No Place Like Heaven, he does make time for warm Elton John piano ballads like “Hurts” and the bittersweet tribute to Freddie Mercury on “Last Party (“Who knew that mercury could rise so fast/Enjoy the party ’cause this is out last”). Expect the record label to once again focus on releasing singles that tickle the fancy of his devout UK fan base. But there’s more on No Place In Heaven for us to dig, enough to make him a viable import. It will be up to us, based on our own inclination, to take that leap of faith to make that archaeological dig. What we will inherit will be exceptionally good to our ears.